“Treated Water Pipeline” (TWP) is the term used to describe the 323 miles of pipe that will be used to transmit treated water from the treatment plant to the 20 members. Sizes of the pipe range from as large as 54″ diameter to as small as 6″. A series of booster pump stations and storage reservoirs will be located along the TWP. The backbone of the TWP is the 54″ diameter “trunk line” that runs from the treatment plant to the reservoirs near Tea. The TWP projects to date are listed below in chronological order. Depending on available funding, there were times when a planned project was made larger or smaller so some segments have an “A” and “B” designation. The contract was awarded to S.J. Louis Construction of Waite Park, MN in February 2005 and substantial completion was reached in July 2006. Final construction cost was $11.2 million. This segment west of Sioux Falls was 4 miles of 54″ diameter steel pipe and 5 miles of 36″ along 467th Avenue from 12th Street to a mile south of Tea. The contract was awarded to High Country Pipeline of Penrose, CO in October 2005 and substantial completion was reached in October 2007. Final construction cost was $10.2 million. This segment was 7 miles of 54″ diameter steel pipe along 467th Avenue from 274th Street south of Tea to 281st Street south of Lennox. The contract was awarded to S.J. Louis of Waite Park, MN in November 2005 and substantial completion was reached in May 2007. Final construction cost was $6.6 million. This segment was 6.5 miles of 36″ diameter steel pipe west of Sioux Falls from 12th Street north to Benson Road. The contract was awarded to S.J. Louis of Waite Park, MN in May 2006 and substantial completion was reached in March 2008. Final construction cost was $27.7 million. This segment was 16 miles of 54″ diameter steel pipe along 467th Avenue from south of Lennox (281st St.) to Highway 46 (Clay County line). The contract was awarded to S.J. Louis of Waite Park, MN in January 2007 and substantial completion was reached in September 2007. Final construction cost was $2.7 million. This segment was 6 miles of 16″ diameter PVC pipe, 2.5 miles of 10″ and a half mile of 8″. It runs mainly along Harrison Avenue between Sioux Center and Hull. The contract also included a meter building at Hull. This project was built earlier than originally planned so it could serve as an “emergency connection” for Hull. Lewis & Clark is purchasing water from Sioux Center and re-selling it to Hull in order to address Hull’s critical water needs until the rest of the pipeline connecting these communities is completed. The contract was awarded to S.J. Louis of Waite Park, MN in May 2007 and substantial completion was reached in April 2009. Final construction cost was $20.9 million. This segment was 11 miles of 54″ diameter steel pipe from Highway 46 (Clay County line) and heading south along 467th Avenue. The contract was awarded to S.J. Louis of Waite Park, MN in June 2007 and substantial completion was reached in August 2008. Final construction cost was $11.1 million. This segment was 5.5 miles of 36″ diameter steel pipe and 3 miles of 30″ along 85th Street in southern Sioux Falls from the main trunk line at 467th Avenue to a half mile east of Cliff Avenue. The pipeline was built earlier than originally planned in order to get ahead of the development along 85th Street, as well as to serve as an “emergency connection” for Harrisburg and Tea. Until the treatment plant began operating in July 2012, water was purchased from Sioux Falls and re-sold to Tea and Harrisburg using this segment. The contract was awarded to Winter Brothers Underground of Sioux Falls, SD in September 2007 and substantial completion was reached in September 2008. Final construction cost was $930,000. The Harrisburg service line was 2.5 miles of 16″ diameter PVC pipe and the Tea service line was a half mile of 16″. These lines connected the communities to the transmission line along 85th Street (SD-Segment 9). The contract was awarded to Don Kelly Construction of Bozeman, MT in May 2008 and substantial completion was reached in December 2009. Final construction cost was $30.5 million. This segment was 11 miles of 54″ diameter steel pipe in southern Clay County that connected the rest of the “trunk line” to the treatment plant. The contract was awarded to Nitteberg Construction of Estelline, SD in September 2009 and substantial completion was reached in August 2011. Final construction cost was $2.7 million. The Parker service line was 14 miles of 10″ diameter PVC pipe and the Centerville service line was 5 miles of 6″. These lines connected the communities to the main trunk line along 467th Avenue. The contract was awarded to Morgan Contracting of Albertville, MN in October 2009 and substantial completion was reached in August 2011. Final construction cost was $3.7 million. This segment was 4 miles of 30″ diameter steel pipe and a mile of 24″ from the Harrisburg turnout to just west of the Big Sioux River. The contract was awarded to S.J. Louis of Rockville, MN in May 2010 and substantial completion was reached in July 2011. Final construction cost was $4.2 million. This segment was 5 miles of 24″ diameter steel pipe from the main trunk line at 467th Avenue to Beresford. The contract was awarded to Winter Brothers Underground of Sioux Falls, SD in July 2010 and substantial completion was reached in October 2010. Final construction cost was $550,000. The Lennox service line was a mile of 8″ PVC pipe and the South Lincoln RWS service line was a mile of 6″. These lines connected the communities to the main trunk line along 467th Avenue. The contract was awarded to Morgan Contracting of Albertville, MN in October 2010 and substantial completion was reached in September 2011. Final construction cost was $7.9 million. This segment was 8.5 miles of 24″ diameter steel pipe along the SD/IA border, which also included the Big Sioux River crossing. The contract was awarded to Judds Brothers Construction of Lincoln, NE in May 2011 and substantial completion was reached in August 2012. Final construction cost was $1.6 million. This project included pigging, flushing, pressure testing and disinfecting the 88 miles of treated water pipeline installed at that time so potable water could be delivered when the system became operational. The contract was awarded to Merryman Excavation of Woodstock, IL in June 2012 and substantial completion was reached in August 2014. Final construction cost was $8.1 million. This segment was 7.5 miles of 30″ diameter PVC pipe on the IA side of the IA/MN border, as well as the first mile of pipe heading north into MN. Dove Avenue on the IA side of the IA/MN border is a joint connection point for Rock Rapids and Rock County RWD. The contract was awarded to Carstensen Contracting of Pipestone, MN in September 2014 and substantial completion was reached in March 2016. Final construction cost was $16.9 million. This segment was 12.5 miles of 24″ diameter steel pipe and 5.5 miles of 14″ PVC from a mile north of the IA/MN border to Luverne. The contract was awarded to Carstensen Contracting of Pipestone, MN in December 2015 and substantial completion was reached in September 2016. Final construction cost was $5.2 million. This segment was 6.5 miles of 24″ diameter steel pipe from the Luverne turnout to Magnolia. The contract was awarded to Carstensen Contracting of Pipestone, MN in March 2016 and substantial completion was reached in September 2016. Final construction cost was $2 million. This segment was 3.5 miles of 16″ diameter PVC pipe. Magnolia is a joint connection point for Rock County RWD and Lincoln Pipestone RWS. The contract was awarded to Winter Brothers Underground of Sioux Falls, SD in June 2016 and substantial completion was reached in February 2017. Final construction cost was $2.8 million. Segment 1 was 5 miles of 16″ diameter PVC pipe starting at Benson Road and heading north to Minnehaha Community Water Corp’s (MCWC) connection a mile west of Crooks. Segment 5 was 5 miles of 14″ starting at Madison and heading east and then south. These segments are part of the interim “wheeling plan” to deliver water to Madison until the middle three segments of the service line (32 miles total) are completed in the coming decade or so. Until then MCWC will purchase water using Segment 1 and then sell water to neighboring Big Sioux Community Water System, who in turn will sell water to Madison using Segment 5. The $9.2 million contract was awarded to Carstensen Contracting of Pipestone, MN in July 2016 and the substantial completion deadline is November 2017. 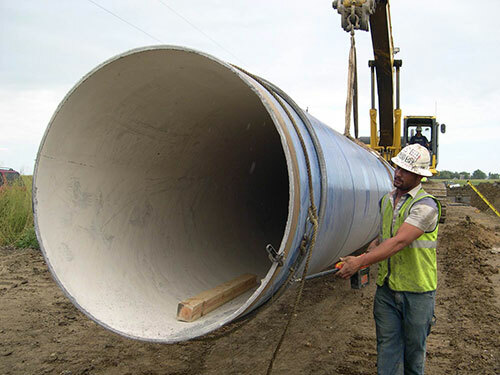 This segment is 10 miles of 24″ diameter steel pipe and 2 miles of 12″ PVC from Magnolia to Lincoln Pipestone RWS’s connection 3 miles east of Adrian. The $2,220,000 contract was awarded to Winter Brothers Underground of Sioux Falls, SD in June 2017 and substantial completion was reached in August 2018. Final completion has not yet been reached. This segment is 3.8 miles of 16″ diameter PVC pipe along Six Miles Road in southeastern Sioux Falls. This is MCWC’s third and final connection point. The $10,785,000 contract was awarded to S.J. Louis Construction of Rockville, MN in July 2017 and the substantial completion deadline is November 2018. This segment is 15 miles of 24″, 20″ and 16″ diameter PVC pipe between Worthington and Lincoln Pipestone RWS’s connection three miles east of Adrian. The $9.2 million contract was awarded to Carstensen Contracting of Pipestone, MN in August 2018 and the substantial completion deadline is November 2019. This segment is 11.2 miles of 24″ diameter steel pipe starting at Beresford and heading east toward the Big Sioux River.